I wanted this post to be named “Usability Lessons from RailsConf Europe 2007” — but realized that only some what I want to write below is about usability. So RailsConf Europe this year is over, and there are a few things i want to highlight from a conference that in general was a smash hit. Dave Thomas’ keynote had a great section about art and the work of great artists. Michaelangelo and DaVinci usually worked with prototypes — paper prototypes — that allowed them to iterate fast and wild. Thomas wanted the audience to work in that way too. What a coincidence that we have been using prototyping as a key methodology at work, and for the last year and half with Ruby on rails. “Everytime you step away from your keyboard, you engage another part of your brain”, he said, refering to using whiteboards, papers, napkins, etc, to sketch ideas and think it over. At leas in Capgemini, the next year will be the year of the prototypes, and I still believe that Ruby on Rails is just fit for this purpose. (yes, I know we can and should do a lot more than just prototypes, but it really is a sweetspot where big enterprise organisations with a fixed architectural platform can still taste some of the advantages with Ruby on Rails). 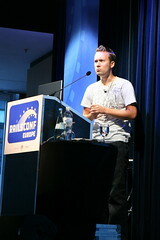 David Heinemeier gave a good keynote the next morning, and one of the things he mentioned was just a little thing for Rails developers. But actually a brilliant example that software can always benefit from: Better defaults. David mentioned that the debugger in the upcoming Rails 2.0 is only working in development environment by default. Which means that your production application won’t break if you forget to remove a breakpoint. Ruby on Rails have a lot of good defaults. As you may have noticed I’m kind of getting obsessed with “better defaults”. it’s the defaults that matter — not what your application can be tweaked to do. Sooner or later your harddisk breaks, you need a new laptop, you start a new project, etc. When the defaults are right, you spend less brain capacity on setting up your computer or project and spend more brain capacity solving real problems. It’s nice to see that there is a focus on better defaults. Mads and I has spent a lot of time preparing our talk “beyond screenscraping: toolbox for changing the legacy world”, and although 150 people left the room just before we started, it seemed as the remaining 50 (or so) people enjoyed the show. One of the questions at the end was a guy that had downloaded the code and tried it out on his companys intranet, and wanted to know how our code would store the password. That people were able to follow along and could try it out during the presentation was more than we expected. Also I afterwards talked to Rob McKinnon, that had some similar experience with using a Rails application ( www.theyworkforyou.co.nz ) for creating a political reason for changing a legacy application (in his case to expose data that formerly was very little accessible). Ruby on Rails have attracted more of the bigger players. This years sponsors included IBM, Sun and Thoughtworks who all seemed eager to tell about how well Ruby on Rails fit into enterprise environments. IBM and Thoughtworks, for instance, claim to employ 50 people working with Rails. David Heinemeier has more thoughts on the involvement from the big players in his blog. Capgemini where I work also have a dedicated involvement in Ruby on Rails, and here from Denmark we try also to be active in the local Rails community (copenhagen.rb) to give something back. Thanks to Jørgen’s boss for paying the dinner. They really deserve the mention. Photos from the evening below. It was really a lovely evening and the discussions continued fueled with beer, as you can probably see on the photos. This entry was posted by Jesper Rønn-Jensen	on Saturday, September 22nd, 2007 at 02:12 (GMT-1)	and is filed under Events/seminars, Railsconf, Speaking. You can follow any responses to this entry through the RSS 2.0 feed. Both comments and pings are currently closed. Just to clarify: I don’t think that Rails has become more “enterprise ready”… On the contrary, enterprises are becoming Rails ready. There is an important distinction here, and with built-in Rails support for web services, and easy apis, it’s only a question of time before real good reasons must occur for not choosing Ruby on Rails. Jesper Rønn-Jensen, front-end web developer, usability specialist at Nine A/S. Acts as a usability evangelist and web-standards front-runner mostly working with web prototypes, or sketching wireframes for web applications.